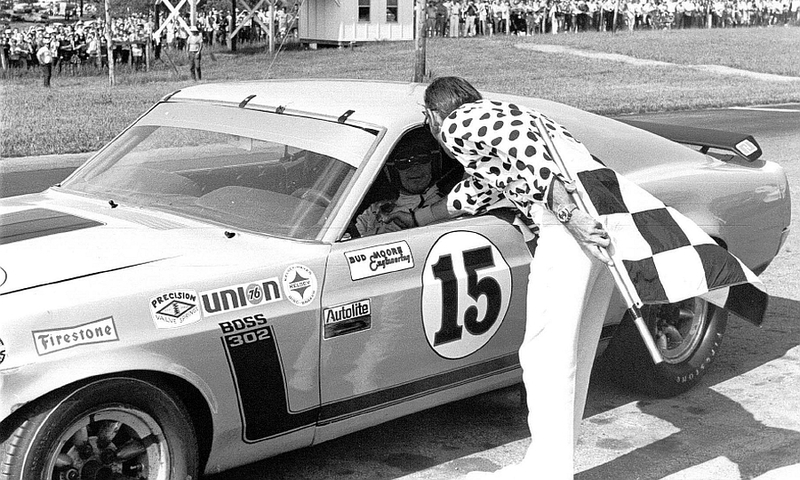 This is the school bus yellow Bud Moore Boss Mustang #15 driven by Parnelli Jones to the 1970 Trans-Am Championship. This car, serial #9F02M212777 (“777”) was delivered to Ford’s racing division, Kar Kraft, in June 1969, to be prepared for the Trans-Am series. “777” was the last of the serial numbered Kar Kraft Mustangs. Subsequently, this chassis was delivered to and further prepared by Bud Moore. 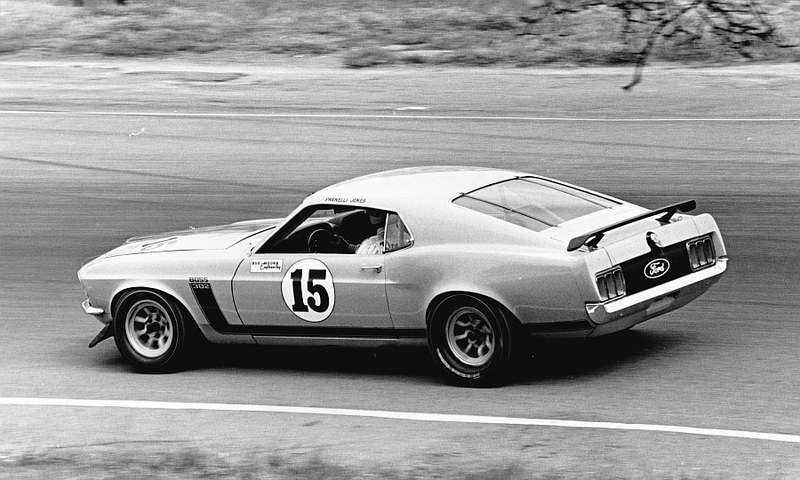 It was then driven by Parnelli Jones for the last two races of the 1969 Trans-Am series. 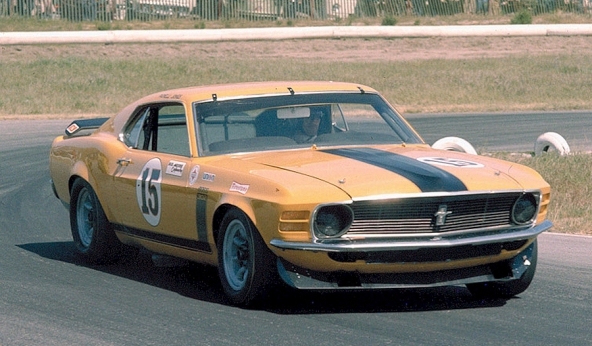 “777” became the primary car driven by Parnelli Jones in the 1970 Trans-Am season. Originally, another chassis, “775”, was intended to be the 1970 primary car, but "775's" new three link rear suspension design wasn't favored by Jones. Parnelli Jones set faster times in “777”, and thus drove “777” in all eleven qualifying sessions and nine of eleven races in 1970. In thirteen races as a Bud Moore team car “777’s” qualifying record is seven pole positions, three 2nds and three 3rd qualitfying positions. 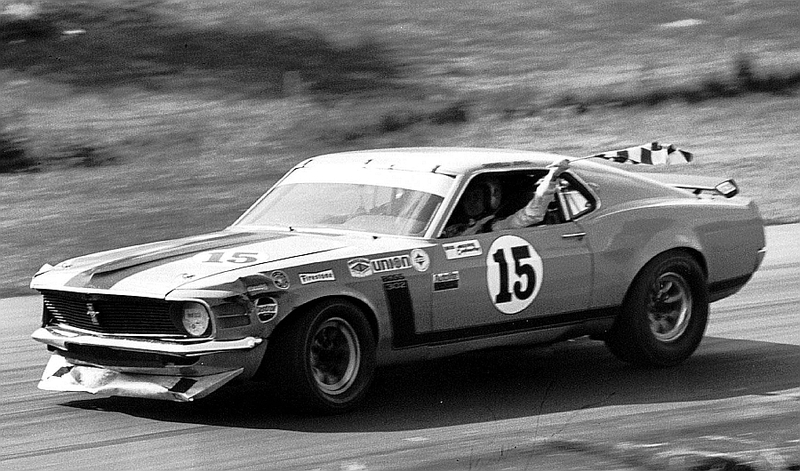 Jones drove “777” to three of his five 1970 Trans-Am victories and earned 40 of his 58 driver’s championship points in it to win the 1970 Trans-Am Championship.